In the 2011 movie “The Big Year” the characters played by Steve Martin, Jack Black and Owen Wilson each set off to have their own “big year,” a competition among birders to see who can identify the greatest number of species of birds in North America in a calendar year. While my birding adventure around Biloxi, MS, didn’t come close to the characters’ 700-plus species, I did discover why the Mississippi Gulf Coast is such a birders delight. The mix of coastal beaches and inland habitats guarantees variety, many times up to 100 species in a single day. The next stop at Longbeach Harbor produced even more—Willet, Killdeer, Black-bellied Plover—followed by Snowy Plover and Forester Tern at the Gulfport Harbor. What I didn’t realize until told is I witnessed a rare bird sighting—an American Avocet. My guide was thrilled as this was a “life bird” for him, one he had never seen before. He quickly made dozens of calls to fellow birders and planned to report the sighting to the Cornell Lab of Ornithology e-bird web site (ebird.org). He expected dozens of local birders would be heading to the harbor hoping to see this mostly inland bird. 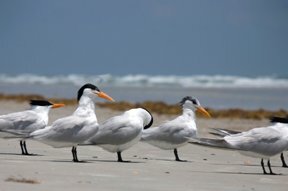 In addition to birding, I learned the beaches in this region are considered a Globally Important Bird Area because there are more Least Terns nesting here than any other site in the world. I learned this portion of the coast is also known for the migrant trap at the Clower Thornton Nature Trail. A trap is a wooded area near the coast where birds take refuge from big storms. They need someplace to land, and the wooded cover gives them plenty of protection and food. If time permits, take the ferry to Ship Island, part of the Gulf Islands National Seashore—the thin strand of barrier islands 10 miles offshore. For more information on the region, visit www.gulfcoast.org. Beverly Hurley is the editor of Triangle Gardener. When she is not gardening, she loves to travel.